The USS Constellation located in Baltimore, Maryland is considered to be a ship that hosts several spirits. 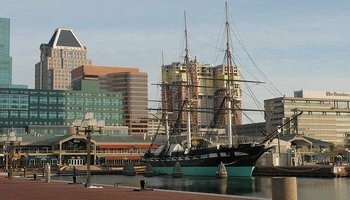 Docked at Baltimore’s Inner Harbor at Pier 1, several individuals who have visited this century and a half year old Navy war ship claim that they have experienced paranormal events. The beginning of the ghostly rumors started in the twenty year period in which the massive ship under went restorations to bring out her natural beauty. Here, you will learn about the hauntings that are said to occur aboard the USS Constellation. From the period of the Civil War to the time of the cessation of the World War II, the USS Constellation had many roles and responsibilities. The most notable occurrence when it comes to this particular ship is that when individuals report seeing what they believe to be “apparitions”, they claim that they look much like the clothing worn in the early 18th Century – even before the USS Constellation was actually constructed and commissioned. These spirits seem to belong to the two ships that emerged prior to the USS Constellation – the Constellation and the Constitution. One of the spirits that apparently haunt this massive ship is a Captain by the name of Thomas Truxtun. It is said that this particular spirit actually appears in the form of a human. There was a caretaker once that was actually guided through a detailed tour of the ship. This caretaker thanked officials of the ship for the tour, and commented on how helpful the tour guide was. Naturally, these officials were quite surprised as no particular tour guide was on the ship the night that the caretaker claimed to have had a tour. It is believed that this particular spirit is that of Captain Truxtun. The next spirit that seems to haunt the water vessel is that which appears to be a teenage boy. This particular boy looks too young to have served as a soldier, but many who have seen him believe that he may have served as what was called a “Powder Boy” on the USS Constellation. This is the boy that would carry gunpowder to the soldiers that were in battle. The soldiers often called the boys ages 13-18 that served this capacity “Powder Monkeys”. In the time of the American Revolution, you could see boys as young as eight serving in this capacity. It is believed that one of these boys, in the 1800s was murdered on the ship. In some instances, individuals can hear what appears to be a young boy screaming and struggling for his life. In other instances, an actual apparition of a boy. Several spirits are said to linger among the USS Constellation. This is because of the fact that many different Seamen died aboard this massive ship. These individuals died while protecting their country, the Constitution, each other, and themselves. Today, many people visit the USS Constellation to pay their respects to the individuals that served on this ship. They also observe the ship in all of her beauty. If you are looking to visit a haunted place that is a bit on the unique side, you may enjoy visiting the haunted ship of the USS Constellation. The USS Constellation is open to the public. There is a small fee to tour her, but it is well worth the price. In the winter hours, one may visit the ship from the hours of 10:00am to the hours of 4:00pm. In the summer hours, one may visit the ship from the hours of 10:00am to the hour of 6:00pm. If you are interested in the paranormal, or simply want to experience some of the unexplained phenomenon aboard a haunted ship, the USS Constellation may be for you.